The sun is out and summer is well and truly here. So, we’re going to say: “Sod that!” and head deeper underground. Come with us into the dark! The headliner is Temple of Aminishi and the first of our Elite Dungeons, where water-acolytes and the guardian spirit Seiryu will keep your combat skills refreshed. But if god juice is your brew of choice, then head to The Hall of Memories, a new training method for level 70+ Divination. Dungeons not dank enough for you? 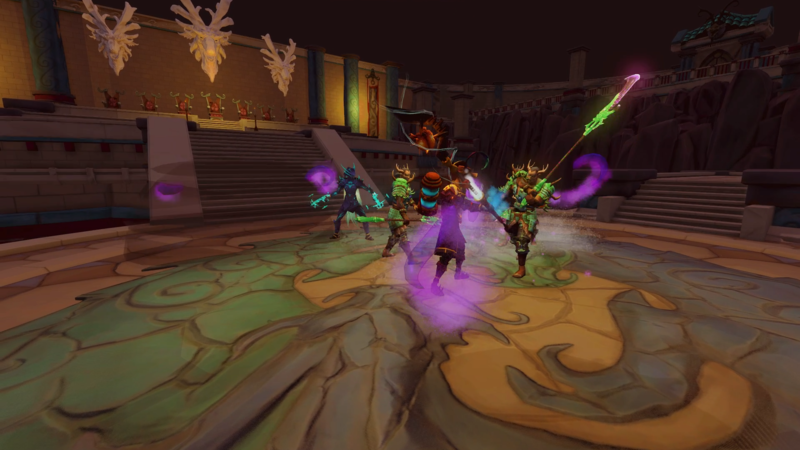 Then let us tempt you with the Menaphos birthday celebrations and an in-game calendar. You can’t go wrong with a dungeon to explore, a group of friends to go with, and a hulking boss at the end of it all. That’s what Elite Dungeons are about: the sheer joy of having each other’s backs as you churn through mobs, mini-bosses and finally, a giant chained-up, dragon-spirit-thing called Seiryu. Aminishi is our first Elite Dungeon, and we want to see what you make of it – mainly because we’re eager to bring you more in the future. Go solo or duo if you’re daring, or jump in with two other players for the recommended experience. 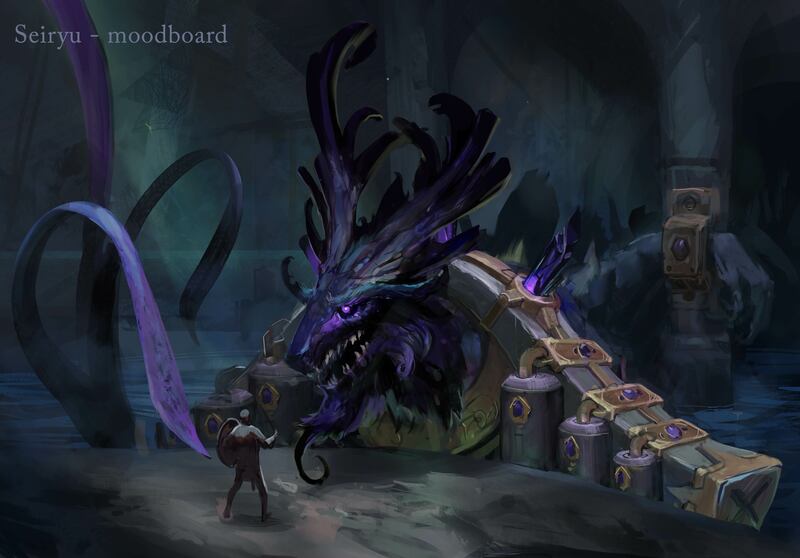 We even offer a story mode if you’re more of a lorehound – an experience that delves into the back-history of Seiryu. Elite Dungeons are intended as an alternative training method for Dungeoneering, bringing you Dungeoneering XP, tokens and swathes of new unlocks. That includes tier-92 power armour, upgraded from Sirenic and Tectonic sets; Invention blueprints for untradeable versions of magic notepaper; and tier-88 upgrades to Player-Owned Ports weaponry. You won’t need levels in the 90s to access the dungeon. A boat will be waiting for you at Port Sarim after the Impressing the Locals novice quest, ready to take you and your mates directly to Aminishi. Someone who liked his dungeons was Guthix and, this month, we’ll be revealing the entrance to one that he'd rather you didn’t know about. Beneath the Memorial to Guthix site, South of Piscatoris, you’ll find the Hall of Memories. 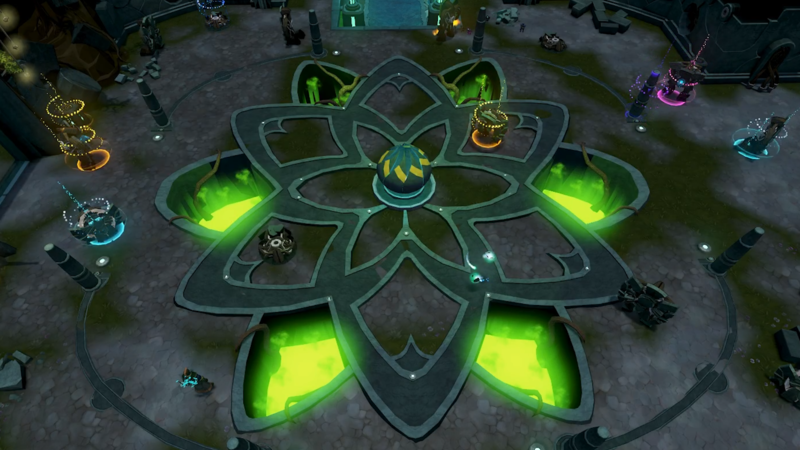 Rather than being full of fluffy, happy memories of Guthix, this containment chamber is populated by his darkest secrets and forbidden knowledge. Perfect for training your Divination levels, right? Drop into the halls with level 70+ Divination, and you’re ready to start levelling up. Rather than continuously running back and forth to a crater, the Hall of Memories equips you with jars that have a greater capacity than your inventory. Fill up dozens of these before you dump them into the crater for windfalls of Divination XP. This is all livened up with boosting butterflies of recollection, forbidden lore to collect, new Divination perks to unlock, and outbursts of knowledge that turn the cave into the equivalent of a Guthixian balloon drop. Can you believe it has been one year since the gates of Menaphos opened? Well, we can, as we’ve been preparing a bit of a birthday celebration for it! And we’re also doubling the number of obelisk and scarab spawns throughout June, among a number of other fixes. Talking of birthdays, we’re bringing the long-awaited in-game calendar to RuneScape. This will be accessible from the game clock, and will keep track of everything that’s going on in Gielinor. Live streams, boss masses, temporary events, news posts and more will be available for your browsing pleasure from this simple one-stop interface. Summer means sales, and Solomon duly obliges with items discounted throughout June. Check back every week for new sales. We’ll also be adding to his wares with three new playing-card outfits, including my personal favourite, the twisted jester (which has a barmy walk override), plus the Kings and Queens of Spades and Diamonds. On Monday, 4th June, Vic the Trader will also make a welcome return for three weeks, with the Elite Trapper Outfit and Dwarven Tools being added to his store. If you’re liking what you’re seeing so far in this Month Ahead, then why not pony up for a Summer Special package? There are two options available to you: 3 months for the price of 2, or the half-year Premier Club option, which gives you 6 months for the price of 5, as well as a slew of Premier Club benefits. Please check here for more information. Finally, there’s the small matter of RuneFest 2018. Tickets have gone on sale for this two-day event, taking place on the 5th and 6th October. Besides the opportunity to meet each other, high-five a JMod and learn more about upcoming releases, you’ll get the ‘RuneScape Live’ experience. This is a musical extravaganza performed by the Royal Philharmonic Concert Orchestra, and – honestly – we can’t wait. That’s a good note to end the Month Ahead on. We hope you’ll join us in the deep, dark and dirty month of June, as we bring you the very best in our fine line of dungeons. Any info regarding whether or not the Summer Beach event will make a return this year? It's always been a fun and relaxing event. Upgrades to port weapons, very nice! Also looking forward to seeing more of Guthix's lore. There was that one part of The World Wakes where you had to answer riddles involving difficult decisions, in the name of balance. It'll be interesting to delve deeper into some of Guthix's darker choices. Plus, thank you so much for making magic notepaper available through gameplay and not MTX. Looks like an interesting month. Looking forward to exploring the new dungeons, and the Menaphos tweaks and fixes are appreciated. Looks great, hopefully it will be great as well. Really? I mean sure, it's okay I guess, but why does divination still get more stuff added to it, when skills like agility, construction etc are in much bigger need of revitalization? Would be fine, if not for the fact that dailyscape is probably going to become even worse, following this update. How about fixing that first? If you’re liking what you’re seeing so far in this Month Ahead, then why not pony up for a Summer Special package? No thanks, not interested in your scummy business practice of deceiving the VIP members. Love the new graphical updates on Sirenic and Tectonic, even love the upgraded variant (as shown in the video) even more. But what about a graphical overhaul of Malevolent aswell? And the upgraded variant? Also, there are upgrades to Sirenic and Tectonic sets, but not to Malevolent.. just wondering why? So when will all this come out?? Its June today, something could have been up now? The big question of course is, how are you fixing the issue of Death Lotus Darts? You have magic and melee weapons from ports that degrade and are augmentable, yet range is stuck with weapons that are lost in use and can not be augmented. Fix this before you go adding enhancements to the port weapons. Why upgrade items you have to continually make and can not augment like their melee and mage counterparts? Lovely and all but when are bank place holders and shift drop released?